On Saturday, May 24, 2008, I traveled west and north from Hovenweep National Monument to Moab, Utah, a distance of 120 miles. Once I got past the ancient Bureau of Indian Affairs (BIA) roads, the trip north on US Highway 191 was easy, even with while towing my travel trailer. Arriving at the Moab Rim Campark, just south of Moab a day earlier than expected I found that there was no RV space available that night in all of Moab. Thinking that the remote Bureau of Land Management (BLM) Horse Thief Campground would surely have space, I drove thirty miles up Utah Highway 313, only to find that there was no vacancy at any campsite within fifty miles of Moab. With gasoline right at four dollars per gallon, my sixty mile sojourn to Horse Thief and back cost me around forty dollars. Although high gas prices are supposed to be a deterrent to travelers this summer, it seemed like everyone within driving distance of Moab had decided to give it one last gasp before mothballing their camping equipment. With nowhere else to go, I drove back to Moab, then south on Spanish Valley Drive to the Pueblo Verde development, where I have a deposit down on a residential building lot. That night, I camped by the curb at Lot #7, where I plan to build my dream home in the next couple of years. With only six of the twenty-eight lots currently occupied, the setting was tranquil and quiet. Since my coach is self-contained, I had everything I needed to “dry camp” on the street. The added bonus was to wake up and see the 360-degree view of the Spanish Valley as it will look when my house stands on that site. To me, there is no better residential view in America, centered as it is between the Moab Rim and the peaks of the Manti La Sal National Forest. On Sunday, I moved to my reserved site at the Moab Rim Campark, where I spent the next six nights. Meanwhile, my love flew from Burbank, California to Grand Junction, Colorado, known simply as “Junction” to the locals. Picking her up at Walker Field Airport in Junction, I noted that their parking and traffic circulation upgrade was still not completed. To my dismay, it features a main access point that few if any large RVs or busses could negotiate without overriding the curb. This is what we in America used to call “Progress” with a capital “P”. After driving west on Interstate Highway I-70 back towards Moab, we cut off at State Route 128, which goes through the abandoned cattle and railroad town of Cisco. Cisco is famous for a nearby uranium ore strike in the early 1950’s. Today, it is a crumbling wreck of buildings, many built from surplus railroad ties. 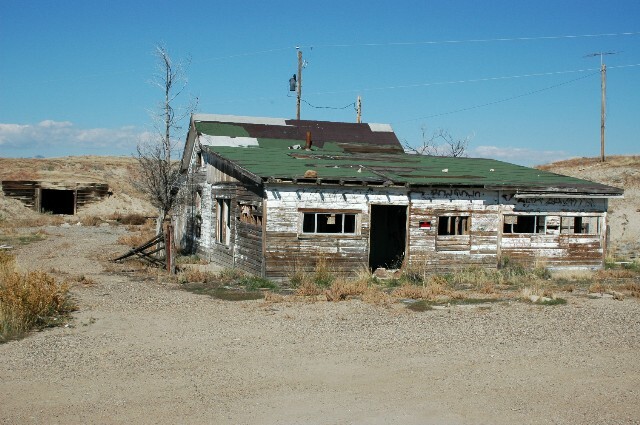 It looks too new to be a ghost town, but to old and decrepit to resurrect as a quaint tourist trap. From there, the old two-lane highway wends its way across open prairie, then through ranch land and finally to the Colorado River, near the site where the historic Dewey Bridge was destroyed by fire in April 2008. It was a classic case of a child playing with matches in a nearby campground. 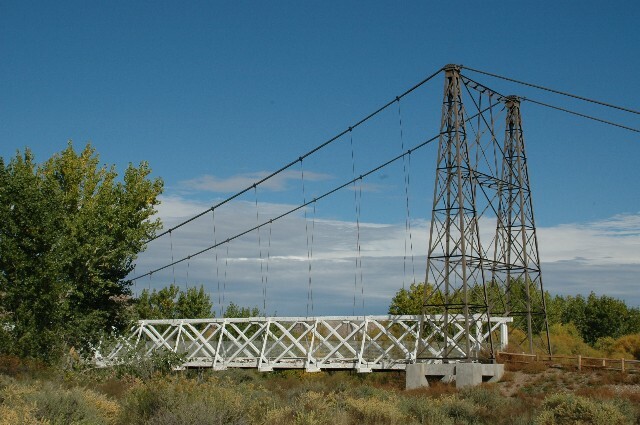 His “science project” got away from him and rapidly burned the wooden bridge-deck of the old suspension bridge, a now lost treasure on the National Register of Historic Places. Pyromaniacs of the world take note. Karma will seek its own resolution, whether here in this life, or at some future time and place, as determined by the confluence of fates. There is at least one young boy somewhere in this land who will long remember his lack of judgment that windy April evening. After crossing on the new bridge, the subsequent automobile trip down the Colorado River is its own reward. Entrenched in a deep canyon along this stretch, the river was only a few days past its springtime, 2008 peak flow. To the delight of the many rafters, there were rapids where usually one found only sandbars. As the waters slowly receded, rushing water swept the banks clean of candy wrappers and plastic bottles, leaving the river looking much as it did in primeval times. Along the way, we stopped at the Castle Creek Winery at Red Cliffs Lodge for an early and satisfying dinner. The winery, billed as “Utah’s first and largest commercial winery” produces good, if a bit light wines that are consistent from year to year. If you stop there, be sure to take a look at their Moab Museum of Film & Western Heritage, featuring “100 years of Cowboy History”. 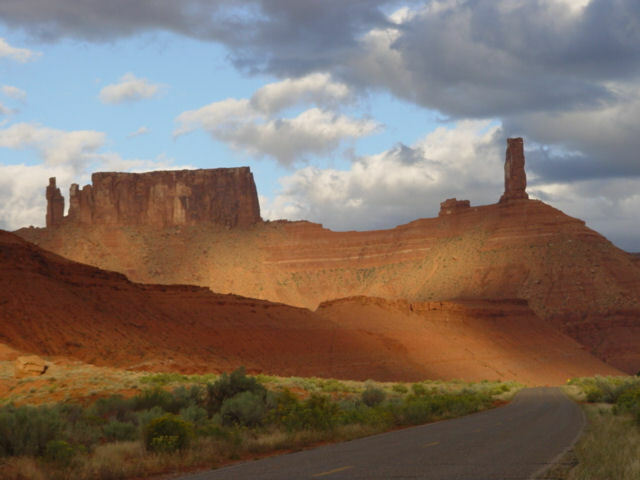 Because of its undeveloped remoteness, yet easily accessed services in Moab, many classic western movies were filmed here and in nearby Castle Valley.